An account of the 1983 Long Kesh prison breakout, which occurred 30 years ago this week. In October 1981, at the end of the Hunger Strike, the British government announced the defeat of the republican prisoners in the H Blocks of Long Kesh. Less than two years later, 38 of those ‘defeated’ republicans smashed their way out of what had been claimed as the “most secure jail in Europe”, inflicting a major political and military defeat on the British. The 1983 escape was a major undertaking for the Irish Republican Army, both inside and outside the jail. The organisation outside the prison devoted time and resources to the breakout plan during a period of intense pressure by the British. Inside Long Kesh, the republican POWs spent countless hours in preparation - the painstaking collection and collation of intelligence, the meticulous planning of each stage of the operation, the continuous briefing of people on their roles and the acquiring and safekeeping of weapons vital to success. It was Ardoyne tactician Larry Marley who established the bold and expansive objective of getting the maximum number of men possible out of the jail. He led a specialist team of five men selected by the camp leadership and entrusted with the business of organising escapes. He masterminded the escape plan that would revolve around a weak link identified in prison security, the lorry used to deliver meals to the different blocks. Of particular interest was the fact that the lorry was never searched on its way round the camp. The escape committee next turned their attention to seizing control of a H Block. They realised the key to such an ambitious plan was gaining control of the central crossbar of the ‘H’, which serves as an entrance hall and administrative area and is known, in a throwback to Victorian jails, as “the circle”. In order for their plan to succeed, the prisoners realised that they had to lull the staff into a false sense of security. The ending of the ‘no-work’ protest aided this plan, as it meant the prisoners were out of their cells for long periods, aiding the psychological battle against the screws, who now found themselves outnumbered. The prison authorities, eager to publicise the ‘normalisation’ of the prison, were happy to put prisoners to work as orderlies cleaning all over the block, including the circle. The end result of this was a situation whereby some of the most renowned republican prisoners in Long Kesh became apparently eager to do prison work and made concerted efforts to become pally with screws. The prisoners in H7 carefully nurtured a relaxed atmosphere until it became the norm and the screws viewed security breaches by the prisoners as innocuous. A number of the prisoners ordered to befriend the screws were not aware of the escape plan and swallowed this bitter pill on trust. Other prisoners, also unaware of the escape plan, were upset at what they witnessed, not surprising given the brutal history of previous years, and there was a constant rumbling of discontent below the surface. The camp leadership appointed Bobby Storey as OC of the operation and Bik McFarlane as his adjutant. Both were already members of the escape committee. Finally, Sunday 25 September was chosen as the appointed day, and the plan was put into effect. As the day approached, more prisoners were let in on the plan and those on the list to escape were informed. Other prisoners would play a vital role in taking the Block and guarding the screws but would not be escaping. In the event, the Block was taken according to plan. One screw was shot and injured when he attempted to shut the door of the control room and raise the alarm. The next stage of the plan also went well. The food lorry was successfully hijacked and the driver was forced at gunpoint to take his now human cargo out of the prison. Where the escapers ran into problems was at the tally lodge at the prison’s main entrance. The plan was to seize control of the lodge, hold the screws inside hostage while the lorry was driven through the ‘airlock’ at the main gate. Everyone was then to rendezvous with a heavily armed force of IRA Volunteers who were waiting a few miles from the jail. But by this stage the escape was running 20 minutes late and the lorry’s arrival coincided with a shift change for the screws. Those prisoners who took control of the tally lodge were soon knee-deep in screws, as they arrested more and more as they came on duty. Eventually the prisoners’ hand was forced when more screws coming on duty realised that something was wrong and two of them blocked the gateway with their cars. Bik saw this as he opened the main hydraulic gate and he and Bobby quickly conferred, realising that the general alarm was about to be sounded. The prisoners had no option but to leave the lorry and rush the main gate in numbers. Thirty-five prisoners managed to breach the prison perimeter successfully. In all, 19 of those on the escape were quickly recaptured, but the other 19 successfully managed to evade capture, by a variety of means and routes. One screw, who was stabbed in the struggle at the tally lodge, later died, but the coroner subsequently ruled he had succumbed not to his wounds but to a heart attack. 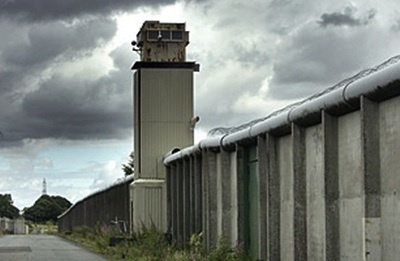 Back in the prison, when the screws retook H7, the rearguard were strip searched and were then made to run a vicious gauntlet of baton wielding screws and dogs, as they were moved to H8. * In July of this year, it emerged how deeply the 1983 escape affected the Thatcher regime. Concerned about the huge boost to republican spirits, Thatcher said she regarded the escape “most seriously”. After learning it had involved scores of prisoners, the so-called ‘Iron Lady’ privately admitted the breakout was “even worse than we thought”.